The supposed first recording of an electric guitar was by jazz guitarist George Barnes, who participated in a recording session with blues artist Big Bill Broonzy in Chicago on March 1st, 1938 waxing two sides, "Sweetheart Land" and "It's a Low-Down Dirty Shame". 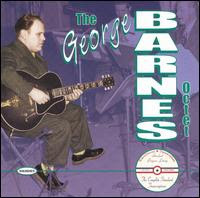 George Barnes has been neglected by historians and critics as a major pioneer of the electric jazz guitar, but this fact has nothing to do with his abilities as a musician. 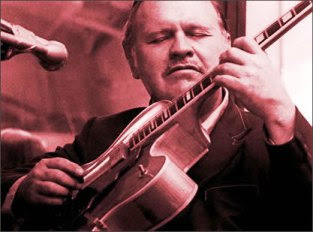 Some years ago Richard M. Sudhalter rescued George Barnes from oblivion in his excellent book, 'Lost Chords', and about the same time was issued a two cd-set of the recordings made by George Barnes and his Octet for Standard Transcriptions 1946-51 shwoing off his elaborate work as an arranger, composer and guitarist. Craig Jolley writes about these recordings at All About Jazz : "Barnes' writing is the key to the octet. He liked to let the reeds (mostly clarinets) establish a rhythmic feel and suddenly interrupt with a guitar break, improvised or written. The reeds would then ease back in behind him supportively for the last half of his solo or maybe play riffs for him to play against. Sometimes the reeds would split into subsections for call and response of their own. Things never stayed in one place long — the tempo picked up, the lead passed to another instrument, or a previous theme reappeared in variation. The clarinet lines formed intricate, well-timed countermelodies. Though the arrangements were carefully crafted they do not sound contrived, and there is a sense of spontaneity. The music has a light, friendly sound (The drums usually whisper.) in contrast to contemporaneous bebop.(...) Barnes is the only soloist, and he does not stretch out much, preferring to serve the whole. The tunes are varied and short. Some pieces (”Blondie Buys a Boat,” “Kilroy Is Here”) were titled with a programmatic references, often to the popular culture of the times." - Unfortunately, the mentioned 2 cd-set is currently unavailable from major retailers and online stores, but it's definitely worth searching for, if you are interested in learning more about an unusual effort in the story of the electric guitar in jazz. Like many other pioneers of the electric guitar George Barnes also made experiments with multi-track recording of the instrument. I found a couple of examples of his practise in this field at YouTube inserted below. - Here is George Barnes playing a rendition of "Tiger Rag"
To end this, here is a multi-track recording of "State Street Boogie"
De Nederlandse vertaling van deze blog verschijnt morgen onder de titel George Barnes, Pionier van de Electrische Gitaar. Please mind that my statement about GB in the article is that he is the supposed first jazzguitarist to record using an electric guitar. - Of course this statement could be modified with additional info covering the experiments by Les Paul, who made his first test-recordings in his garage 1936. But then again, these tests don't belong to the first recordings of an 'electric guitar'. The first documented recordings using an electric guitar (- a kind of hybrid Hawaiian steel-guitar with attached pick-up) were made by Bob Dunn with Milton Brown in 1935. - And to enlarge the picture, that always points out Charlie Christian as the first 'real' genius/pioneer of the electric guitar, it must be mentioned that Eddie Durham in fact recorded with Kansas City Six feat. Lester Young in March 1938 - 14 days later that the session mentioned by George Barnes with Big Bill Broonzy. - Yes, Charlie got his first electric guitar pickup and amplifier from Eddie Durham, who spotted his talent at once. But Charlie also learned from Eldon Shamblin, another forgotten pioneer of the electric guitar, - a member of Bob Wills' Western-Swing group. - Anyway, what's point about being the first? I cannot tell, judge for yourself! In a 1939 interview Barnes said he first played with a band in 1937 (which would make a quartet of his touring in 1935 out of the question). [Reposted to edit a sentence] A couple of things: Charlie Christian did not get any equipment from Durham. He bought his own guitar and paid it in installments. As for the other stories told by Durham, given the research available (including the dates when Durham and Christian were in Oklahoma at the same time), some scepticism is recommended. Second, Eldon Shamblin did not record with the electric until after Christian had joined Benny Goodman. Christian did listen to and play with white Western Swing players, but Shamblin was not one of them (and the tales about his influence on CC seems to stem from a comment or article — can't remember which — by Leonard Feather).